Special Offers on our Most Popular Cosmetic Surgery Procedures! At Jacksonville Cosmetic Surgery, Dr. Nezami's top priority is to help you be all that you can be! His vast experience and expertise in Breast Augmentation, Body Countouring among many other plastic surgery procedures have made Dr. Nezami on of the most sought after plastic surgeons in the southeast. In fact, in 2016, Dr. Nezami was named among the Top 10 Plastic Surgeons in Florida for Patient Satisfaction by The American Institute of Plastic Surgeons. The Plastic Surgery Specials below underscore Dr. Nezami's committment to helping as many patients as possible, Look and Feel Great about themselves. Schedule a FREE Consultation with Dr. Nezami and take advantage of these very special opportunities, and don't delay... Your Free Initial Consultation must be scheduled during the month of the special offer. Thank you for your interest in Dr. Nezami and we look forward to hearing from you. 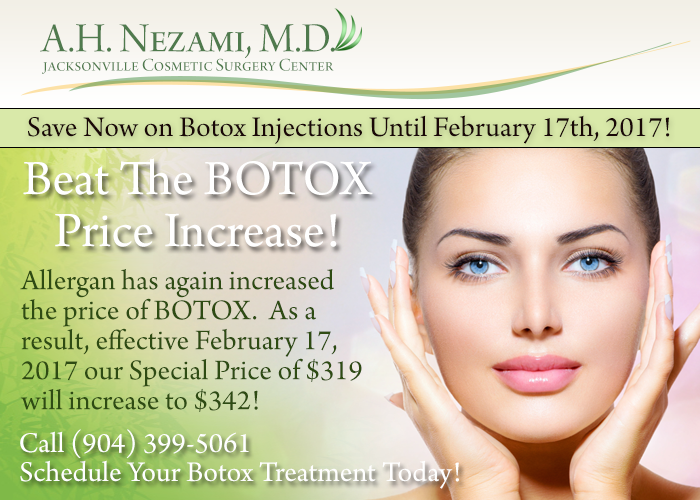 As of February 17th, 2017 our special BOTOX Package below with Susan will increase from $319.00 to $342.00! Book your Botox NOW before 2/17/17 and receive 33 Units of Botox for your Forehead, Frown Lines and Crewsfeet for ONLY $319.00! This promotion is for 33 Units of Botox for the Forehead, Frown Lines and Crowsfeet areas of the face only. The results of any cosmetic surgery will vary from patient to patient due to each persons unique anatomy. You should not expect your final results to look exactly like any of the models or patient's "after" photos seen here on our web site.